Captain Miller is a US Coast Guard licensed 100 ton Master with over 30 years of experience. He is based in New York Harbor at Liberty Landing Marina in Jersey City, NJ. 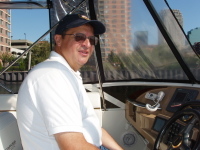 He provides boating instruction throughout the tri-state (New York, New Jersey, and Connecticut) area and delivers yachts throughout the East Cost or arrange for a cruise through The New York Harbor on his personal Carver 444. Call Captain Merrill at 908-347-4022 to schedule a lesson or delivery or for more information. Hire Captain Miller (and optionally a crew or one of his qualified associates) to safely operate your vessel while you enjoy the cruise with your guests. 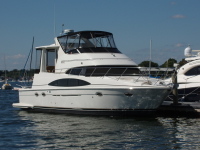 Charter boat services offered in New York Harbor on Capt. Miller's personal Carver 444 for up to 6 people.